Bonterra Cabernet Sauvignon is not only a very fine, complex red wine with nuanced flavors and aromas, but it’s also made from grapes that are grown organically, a true bonus. All of the 1,000 or so acres in Bonterra’s three vineyards in California’s Mendocino County are organic and are annually certified biodynamic, which is a self-contained farming system that uses the interaction of soil, plants and animals in the vineyard to sustain the land and vines. For more than 30 years, Bonterra has been countering the argument that only conventional farming methods work for large-scale grape-growing operations and that big producers can’t make a profit using organic and biodynamic methods. Bonterra, which is owned by Concha y Toro under its Fetzer subsidiary, produces more than 400,000 cases of wine a year and has sales that are growing at a rate of about 13 percent annually, according to an article in Shanken News Daily, an online wine industry newsletter. Earlier this month, Bonterra released the findings of a third-party, peer-reviewed soil study that the vineyard commissioned. The results showed the company’s vineyards sequestered 9.4 percent to 12.8 percent more carbon than vineyards farmed conventionally. The soil study is part of Bonterra’s effort “to champion regenerative agriculture as an important element in the global effort to address climate change,” the company said in a news release announcing the findings. In addition to setting an example for the industry, Bonterra is able to make very good wine for a reasonable price, often within the $10 range when it goes on sale. That’s encouraging, and perhaps more producers of affordable wines will take up the practice of biodynamic farming, even if it does involve burying cow horns stuffed full of manure. Founding winemaker Bob Blue started Bonterra in 1987 as an off-shoot of Fetzer. He grew up in a teetotaling home in Lake County, Calif. His first encounter with wine took place after he enlisted in the Army and was stationed in Germany, which is why he still has a fondness for Riesling, Blue said in a 2018 interview with Harper’s magazine. He joined Fetzer in 1980s, when young, innovative people were taking over the wine industry. “One of the things I got into was organic agriculture. It came left of field, which fit me and my upbringing with the Church of Christ the Scientist,” he said, noting in the interview, that the Church’s philosophy of restraint and his austere upbringing also have helped him as a winemaker. Besides being a pioneer in the organic and biodynamic effort, Blue is called the baron of bourbon for being one of the first to age wine in bourbon barrels. In 2014, he helped Fetzer launch the 1000 Stories line of bourbon-aged Zinfandel, which has seen sales skyrocket from 5,000 cases to 140,000 cases. The line continues to show double-digit growth. Now, every major U.S. wine brand has a line of wine aged in spirit barrels, and the wine category has grown in sales from $800,000 in 2015 to $91 million last year, a recent article published on vinepair.com says. Blue and Bonterra’s director of organic and biodynamic vineyards Joseph Brinkley also are currently featured in the first season of the Amazon Prime series It Starts With Wine. It’s a nicely done, entertaining series that looks at wine production around the world. It’s interesting, informative and worth watching. To make Bonterra Cabernet Sauvignon, chief winemaker Jeff Cichocki says in the tasting notes that he likes to add to the layers of flavor of the varietal by blending in small amounts of other red varietals “to add color, texture and a bit of spice. The result is a smooth, rich red wine with aromas and flavors of cherry, currant and raspberry with hints of toasted oak and vanilla, Cichocki says. 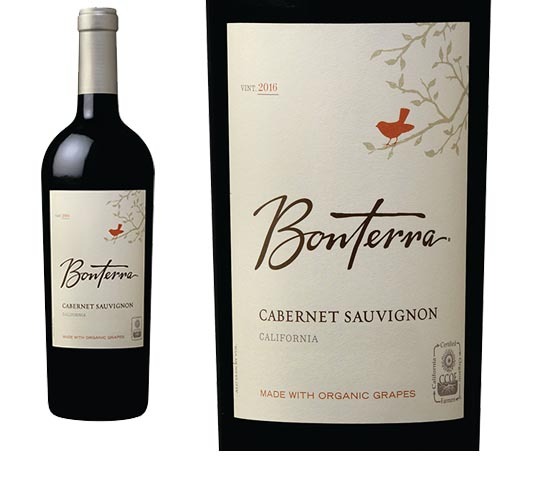 Bonterra Cabernet Sauvignon is widely available. It’s great for drinking with food or on its own, and it’s well worth supporting even at its full price.